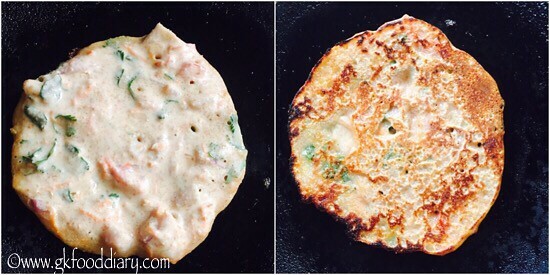 Bread Uttapam – Thick pancake like dosa made with whole wheat bread, suji/rava , grated veggies and cashews. 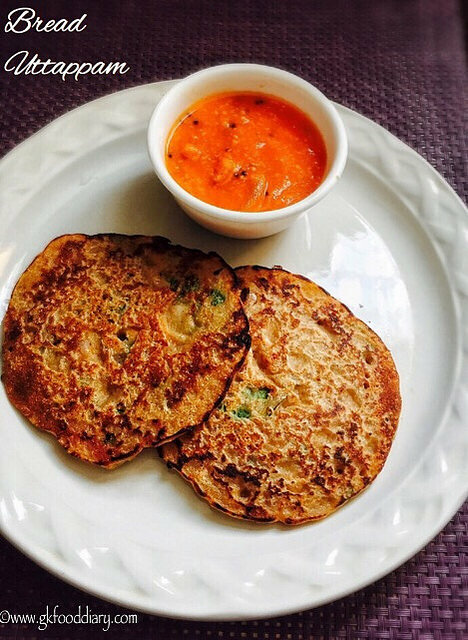 I am sure this bread uttappam will be a quick breakfast/dinner or snack when you pressed for time. I saw this recipe in a magazine and tempted to try it out immediately. We had this as a quick evening snack along with tomato gravy (you could serve plain too) and it was tasty and filling 🙂 The taste and ingredients are similar too Suji toast which I blogged a while ago. This bread uttappam is ideal for babies above one year. You can check our collection of 15+ dosa varieties here. 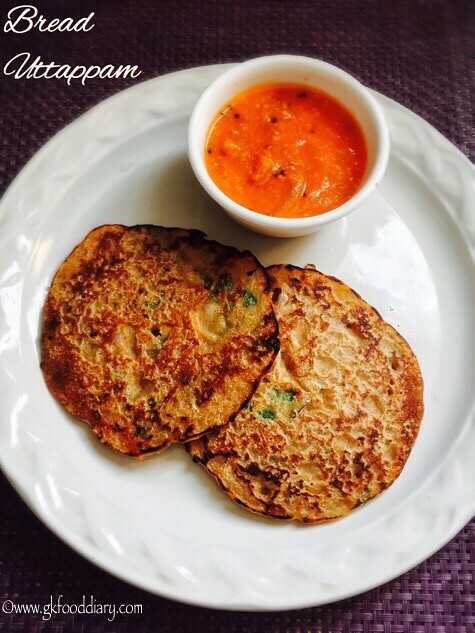 Now Let’s get on to check how to make this easy bread uttappam for toddlers and kids. 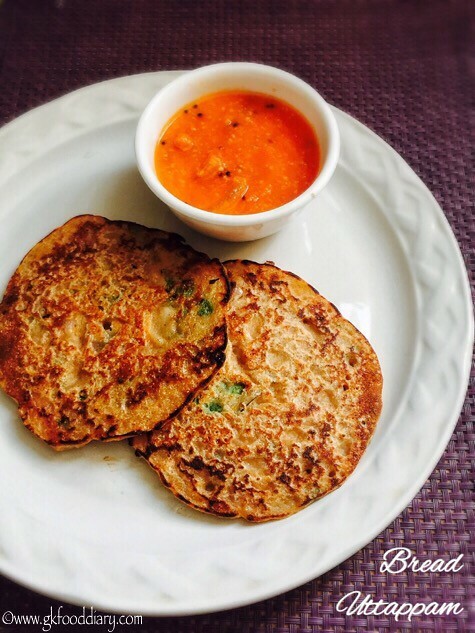 Bread Uttappam - Easy and tasty Uttappam recipe with bread, grated veggies & suji. Quick and filling breakfast/dinner. Keep everything ready. Chop the onions, coriander leaves and tomatoes finely. Grate carrots. Take chopped bread slices, suji, curd and rice flour in a blender. Blend everything to a smooth paste by adding ½ cup of water. Now transfer the blended paste to a vessel and add chopped onions, tomatoes, coriander leaves, ginger, carrots, salt and cashews. Mix everything well and add some water if the batter is too thick. Heat a tawa or iron skillet, add a ladle of bread batter to it and spread it to form a circle. Don't spread too much. It should be thick like pancakes. Sprinkle oil/ghee. Cook in low medium flame. Cook until brown on one side for three minutes and flip it carefully. Repeat the same for remaining bread batter. 1. Keep everything ready. Chop the onions, coriander leaves and tomatoes finely. Grate carrots. 2. 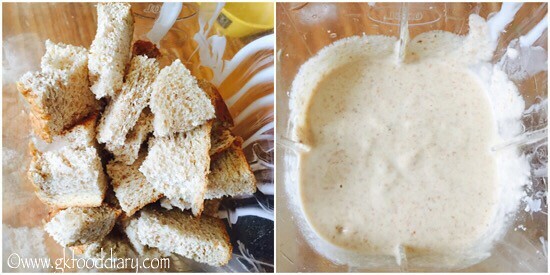 Take chopped bread slices, suji, curd and rice flour in a blender. Blend everything to a smooth paste by adding 1/2 cup of water. 3. 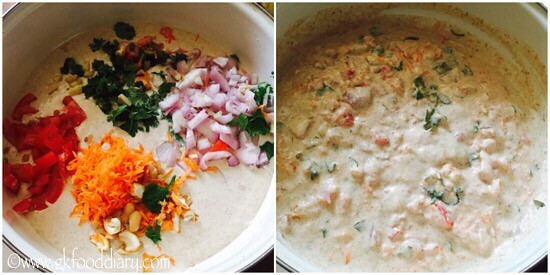 Now transfer the blended paste to a vessel and add chopped onions, tomatoes, coriander leaves, ginger, carrots, salt and cashews. Mix everything well and add some water if the batter is too thick. 4. Heat a tawa or iron skillet, add a ladle of bread batter to it and spread it to form a circle. Don’t spread too much. It should be thick like pancakes. Sprinkle oil/ghee. Cook in low medium flame. Cook until brown on one side for three minutes and flip it carefully. Repeat the same for remaining bread batter. The tasty bread uttappam is ready to serve ! Hope you liked this recipe! To get regular updates, please like my facebook page GKFoodDiary or follow me through Google+,Twitter & Pintrest! You can use broken wheat rava instead of suji. The batter can’t be stored for a long time. So make it quickly as soon as you prepare the batter. 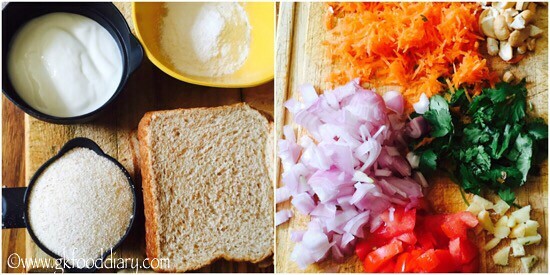 You can add any grated veggies of your choice. Don’t spread this bread uttappam thin. 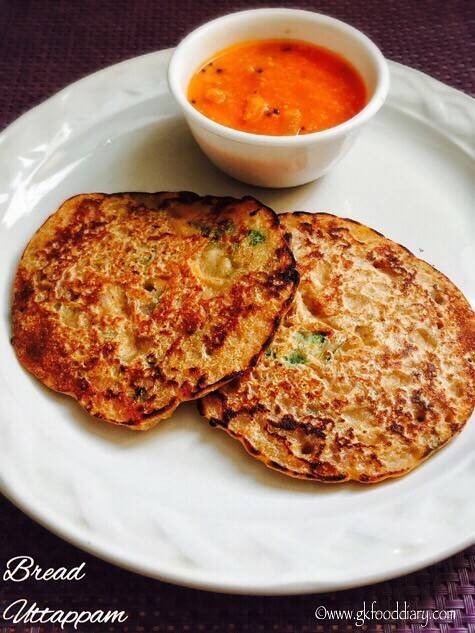 Introduce this bread uttappam to your baby after introducing bread & veggies separate. This bread uttappam tastes best when served hot.